Soon Mahabali became a threat to the Gods by his position and huge popularity among his subjects. Once he went to war with Lord Indra, the king of demigods. A fierce battle followed whereupon Mahabali, the King of Asuras, defeated Indra and proceeded to occupy Indra's territory. Having defeated the Indra and the other gods, Bali became the King of Heaven. Thus, he rose to be the undisputed ruler of all the three worlds. Violence was inflicted upon the Devas(demigods). To save themselves, the demigods collectively approached Lord Vishnu and asked for his help. Aditi, the mother of Lord Indra, was very much upset over her son's defeat at the hand of the demon king. On the advice of Kashyapa, her husband, Aditi prayed to Lord Narayana and observed a special ritual (Payovrata) with utmost sincerity. Pleased with Aditi's devotion, Lord Vishnu appeared before her and informed her that he would himself place a child in her womb and help Indra. Later, on the 12th day of the bright half of the month of Bhadrapada, Aditi gave birth to a son of uncommon effulgence. That child, known as Vamana, was an incarnation of Lord Vishnu. Even when Vamana was a child, he demonstrated his divine powers by doing marvellous deeds. Now, there was another side to Bali's character. Though a demon by birth, he rejoiced in doing good deeds and giving alms to the poor. No person coming to his door ever left empty-handed. He went to the place where Mahabali was observing the ritual. Once he reached there, he was warmly welcomed by Mahabali who received him with all traditional honours and gave him an eminent seat befitting the status of a holy person. Bali was already warned by his spiritual master that the boy was actually Lord Vishnu and that he would not promise the lad anything. But Bali was a king and a man of honour. He was not a one to go back on his word. Inspite of his master's warning, Bali promised to Vamana to fulfill whatever he desired. Mahabali's rule was considered as the golden era of Kerala. It is said that the demon king had brought great peace and prosperity to the land. 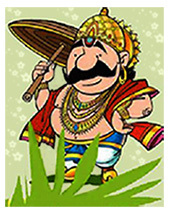 The people believe that Onam is the time when Mahabali comes to Kerala annually to see his subjects. Till today, the Keralites celebrate Onam festival to commemorate the memory of the great King Mahabali who gave everyting to keep his promise. True to his name "Mahabali" (meaning Great Sacrifice), Bali fulfilled his name as the one who gave a great sacrifice for the sake of "Satya" (Truth).